So what is Big History? And why does it matter?? Well, if you are looking for a Wikipedia type definition, you might as well just consult Wikipedia. 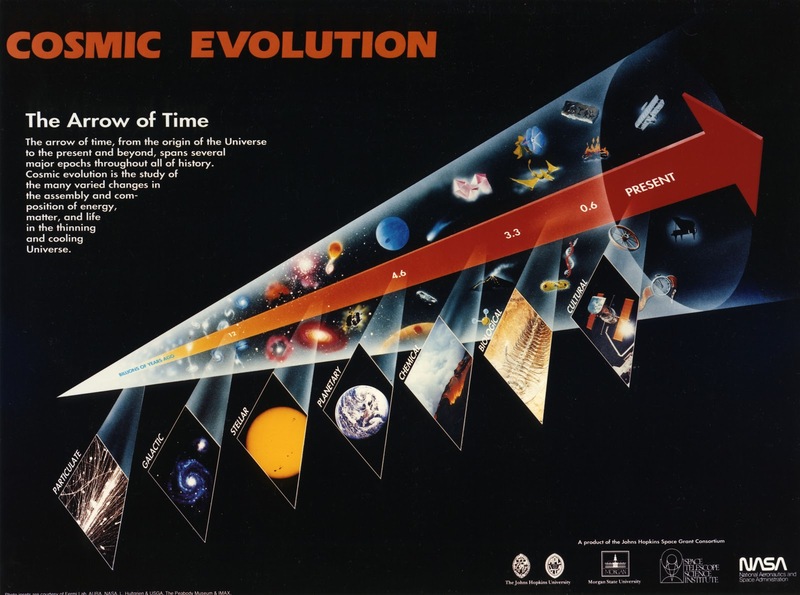 But in the clearest language I can muster, Big History is the scientifically-informed history of the universe from the big bang to the present moment. The universe contains a lot of stuff, but the way I see it, some of it is not stuff at all - like ideas, personalities, emotions, ideas, stories, and cultural phenomena, etc. Because Big History explores the universe that includes everything (including the non-material), it can mean different things to different groups. 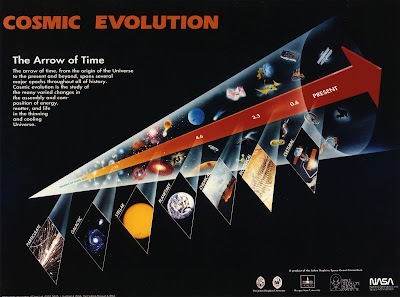 For example, astronomers tend to think of it as cosmic evolution (see the graphic above), whereas philosopher-types had to invent the phrase 'meta-narrative' (collective story of stories) to describe it. An anthropologist might use the term 'creation myth' or 'origin story' while some religious-minded folks call it the 'New Story' or 'Epic of Evolution'. No matter what you call it, what's important here is that it has the potential to reach across traditional divisions and boundaries. Big History is independent of political ideology, race, or religious affiliation, etc. because it includes them all as part of the grand narrative. So Big History explores how things came to be the way they are and Big Historians, not surprisingly, look at the story of it all from the human historical perspective. That, I believe, makes it especially relevant to us humans. Why? Because for the first time in history, the grand narrative is entering into the grand narrative itself. There is currently an upsurge in interest about big history as a framework for formal education. For instance, the Gates Foundation has just funded an initiative to create new on-line high school curriculum called The Big History Project. A small but growing group of educators recently got together and founded the International Big History Association. And even people, like me, are actually able to get a PhD in Big History (see the newly founded Big History Institute at Macquarie University where I am conducting my research). The point is, lots of really smart, thoughtful, people from diverse backgrounds, many of whom are also concerned about the future, see some value in studying and teaching from a cosmic perspective. One of the goals of my research is to understand why.